ASOC Singers and Friends: Eddie's Attic Celebrates The End of the Lockout! Sunday, Nov. 23 from 5:00 pm until ? It's time to show your appreciation for the ASO's triumphant return to Symphony Hall! And the 10th Annual Chamber Music Marathon at Eddie's Attic is the place! All of us who have attended the musicians' community concerts during the lockout know first hand that the ASO is more than just a collection of symphony orchestra performers. These are highly skilled players, masters of the symphonic form, who also happen to be passionate about all forms of classical music ... and especially chamber music. Because the players are deeply invested in the future of classical music in Atlanta, they are constantly searching for new and exciting ways to promote and share their love of chamber music in unexpected places ... including very cool clubs like Eddie's Attic. The Chamber Music Marathon at Eddie's Attic is a popular tradition ... mainly because it bridges the distance between stage and the audience. You'll hear virtuoso playing, you'll interact with the players, and best of all, get to know each player's artistry. This is a unique, personal experience you cannot have in Symphony Hall. Eddie's Attic is a superior 'listening' club, with excellent acoustics ... and is historically known as the place where Live Music Matters! They also have a great bar, restaurant service, and a terrific wait staff. And what live concert would be complete without an adult beverage, a dynamite burger and a chance to pour out your feelings about the lockout to a sympathetic crowd? Come join us! 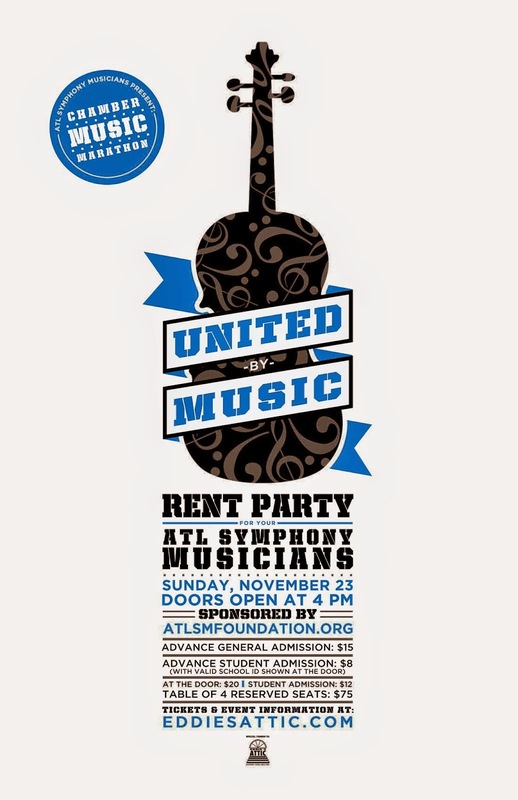 Here's the ticket link: Eddie's Attic 11/23 Chamber Music Marathon Tickets. Reserve a table ... bring your friends ... and get your party on! Thanks for sharing this information! Actually I didn’t know anything about this. Well guys I want to write a blog post on the best event venues Seattle. So I am gathering some information online. I wonder if anyone can help me! Thanks for sharing this information! Actually I didn’t know anything about this.